It is not that Christ ever left Christmas or that He has been removed from it. Christmas is what it is: Christ is always in it. To try and celebrate Christmas without Christ is an impossibility. It is like trying to brush one's teeth minus the toothbrush. One cannot possibly brush their teeth without a toothbrush without first changing the definition of teeth brushing, and in changing the definition of what teeth brushing is is not to redefine teeth brushing, but it is to destroy what teeth brushing is. 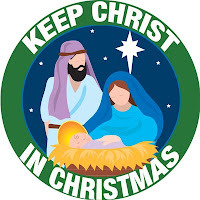 Likewise to celebrate Christmas without Christ is to in essence not celebrate Christmas. What appears to be the the case is that it is us who have left Christ and His Christmas. Christ hasn't moved. We have.